It was a cold night. I woke up several times because I was so cold. It wasn’t until I took all the clothes out of my bag and laid them out under me and my sleeping bag before I slept well. It was just that the sand on the beach was so cold, I needed a barrier between me and the sand. After finally getting a few hours of rest I woke up to the sound of waves, and seagulls and something splashing around in the creek outside of my tent. A lot of things went through my head, but I finally thought that it might be a deer or elk. As I gained the courage to look out, I unzipped the tent and startled a man that was throwing a stick for his dog to catch. It was his dog jumping around in the water and he said that my tent blended in so well with the scenery that he didn’t even see me! I guess I picked a good spot. 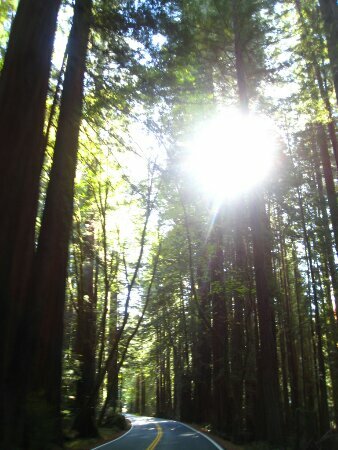 I packed up camp and ate some breakfast on a big piece of driftwood and then walked my bike back up the trail to the road. 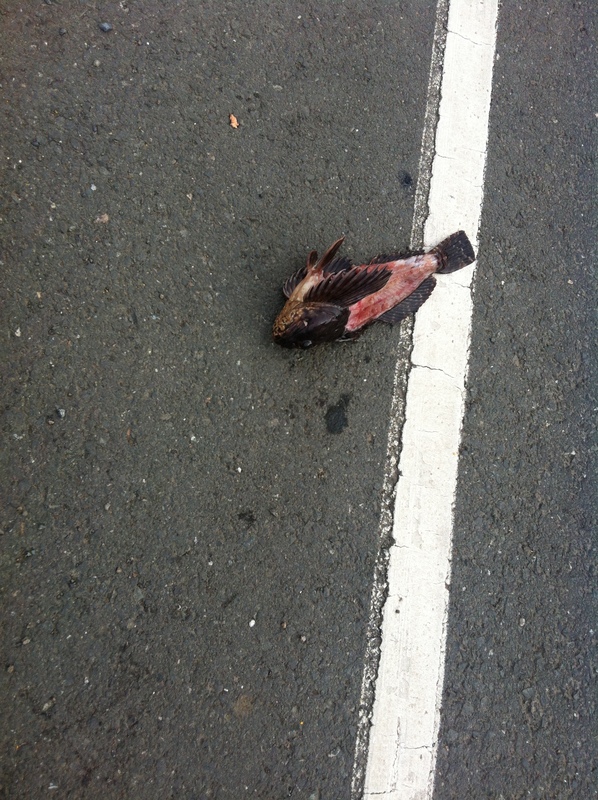 As soon as I started riding I went past a gutted rockfish. I wasn’t sure if it was a good omen or a bad one, but either way it never surprises me what you’ll see. 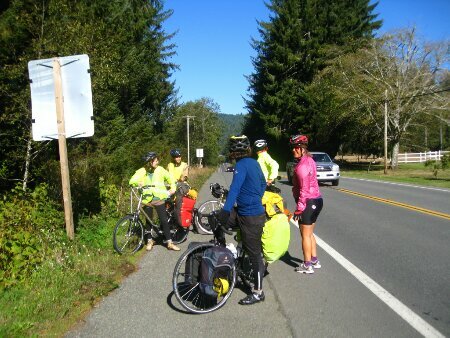 I figured I had about 12 miles until the town of Gualala and I would try to get some coffee and warm breakfast there. 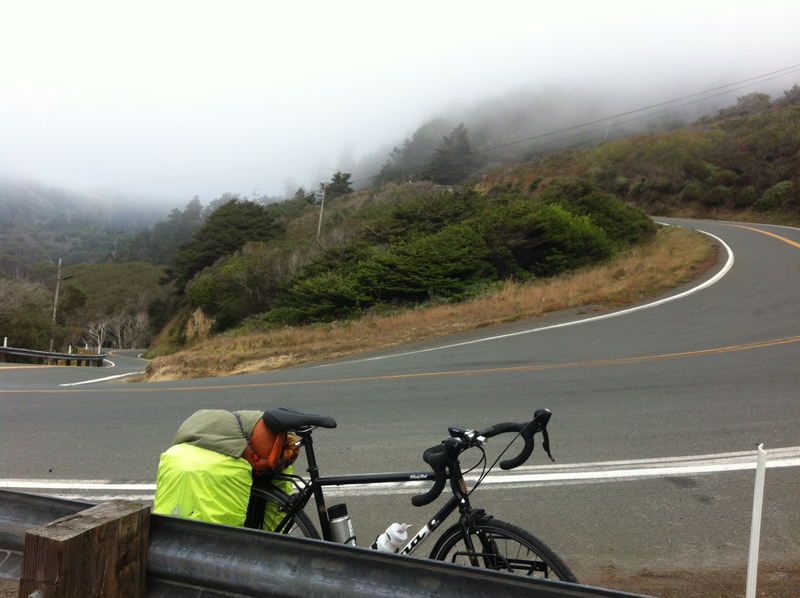 The morning was foggy and cold, but the ride warmed me up and was quite pleasant. My phone was dead though, so I had to wait until Gualala until I could see what the day had in store for me. I found a nice little market that I remembered from 2 years before and got some yogurt, fruit, pastries and coffee and found a place to plug in my electronic devices. I still didn’t have service and couldn’t get good WiFi so I found a crossword to do while I waited for everything to charge. While I was stuck trying to figure out a 7 letter word for converse I saw another cyclist park his bike outside. His name was Nate and was working his way down the entire coast, from just over the border in Canada all the way to the border of Mexico. He had actually started the trip back in August, but had to fly home when he got to Portland, and had recently just returned to finish his journey. 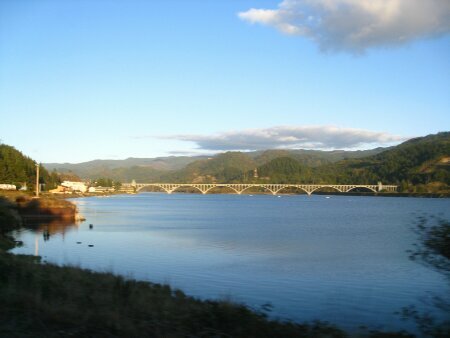 It was his first bicycle tour and planned to be traveling for the next year. He said he had sold his house and spent the last year in Africa and didn’t know where he would end up after this trip. It always nice meeting likeminded fellow travelers. It seemed like it took forever to get my computer and phone charged, and I finally got back on the road a little after noon. As soon as I started on my way, I heard some noise from my rear wheel. I couldn’t deal with it any longer, and stopped about 2 miles up the road to fix it. It was a loose spoke in the rear wheel. I think I had this problem before when I was traveling on a newly built wheel. I tightened it up and while I was at it realigned my brakes, cleaned my rear cassette and readjusted my fenders. This should definitely fix any noise (I hate little noises!). I finally got back on the road around 1:30pm. 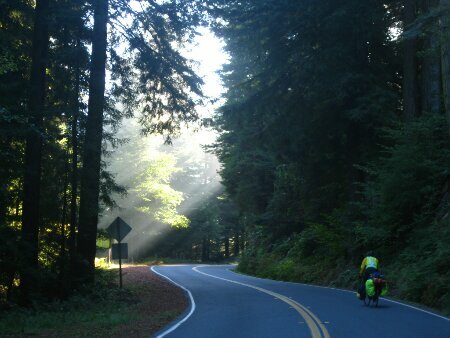 I wasn’t off to a good start today, but the sun had finally come out and I was enjoying the ride. I saw a bunch of hawks and falcons along the road. Some with black and white striped tails, and some with long red feathered tails. Then maybe about 10 miles down the road I crossed a pack of wild turkeys. Sometimes I wish I was more of birder so I could identify all the cool birds I see. 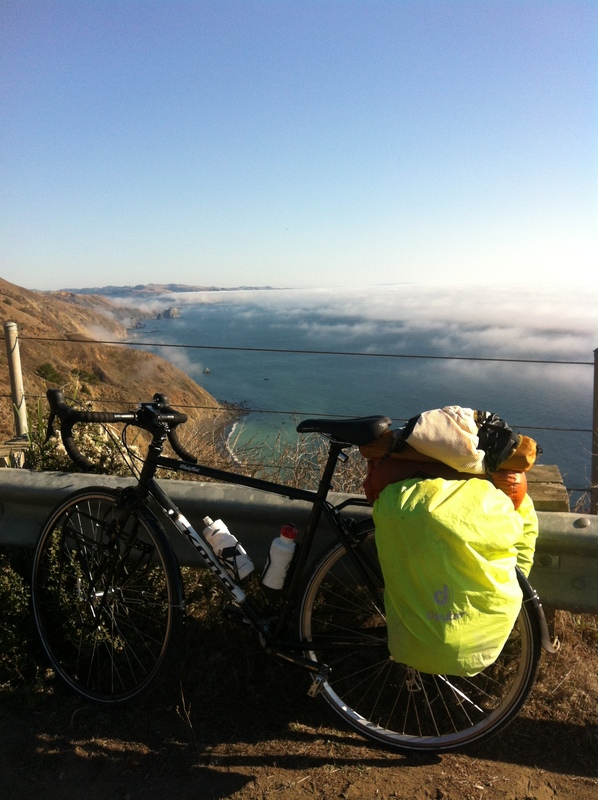 The coast was beautiful, but the 180 degree turns and ups and downs didn’t stop with yesterday’s ride. I found myself climbing quite a bit, but it was definitely a lot more pleasant with all the weight I left behind. My phone didn’t have service for most of the day and the towns were few and far between. 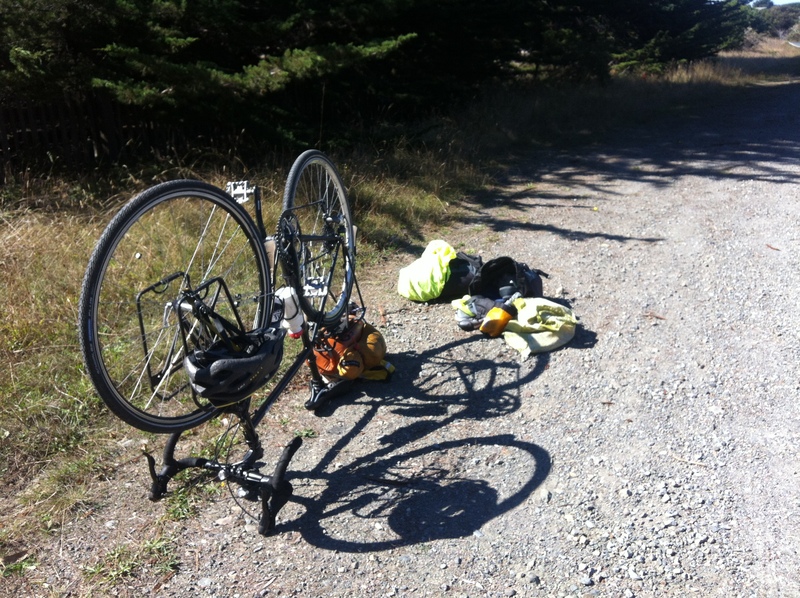 I eventually stopped for lunch at a place called Stillwater Trail around 3:00pm. I had also just crossed over the 700 mile mark for the whole trip, which made it about 33 for the day. I ate some fruit and pistachios and an energy bar and figured I had another 15 miles or so until I could get a good meal in Jenner. 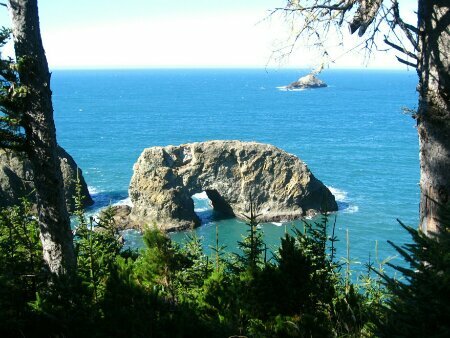 Sonoma county along the coast is absolutely breathtaking. It was such an awesome day today. The 15 miles to Jenner took a little longer than I expected because I had a ton of climbing to do along the way. The climbing though, also added to the scenery and I found myself high above the clouds and the ocean with nothing but sunshine surrounding me. I got so warm in fact that I decided to take my shirt off and work on my tan as I climbed higher and higher. In Jenner a lot of the restaurants looked kind of fancy so I found a gas station with a deli. I got a spinach and feta calzone and some iced coffee and took a nice long break to eat. 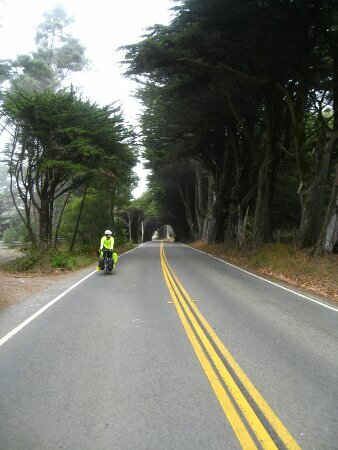 It was starting to get late and I had about another 11 miles to get to Bodega Bay. I could see the road ahead of me was foggy too, which meant it was going to be a little cooler than the last part of my ride. A few miles up the road the fog got so thick that you could just make out the faint disc of a sun, and if I didn’t know better I would have mistaken it for the moon. 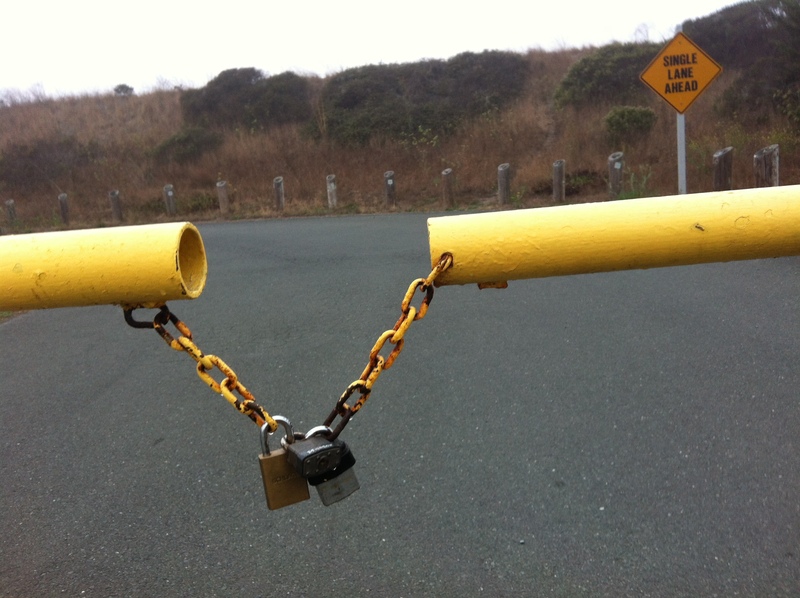 As I past the Bodega Bay Campgrounds, the sign on the outside said it was full. I stopped to check my phone to see if there was anything else available and was greeted by a man named Silas (sp? ), who I had been leap frogging with all day long. 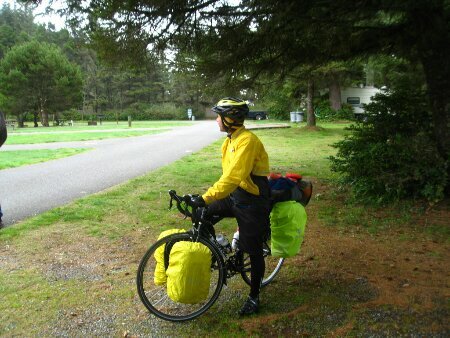 He was traveling with an RV and some bicycles and a few other people. 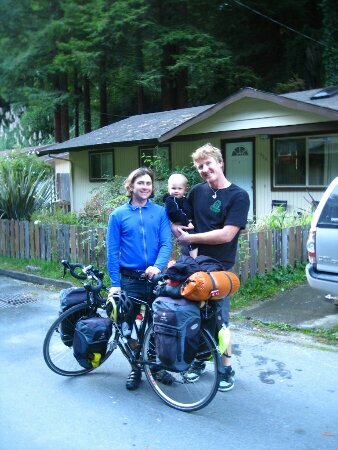 He was super friendly and had met Eli (who helped me camp the night before) and had heard a little about my travels. 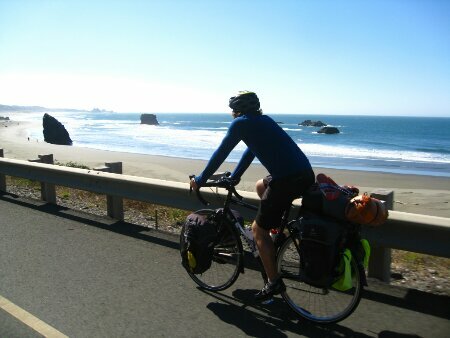 He seemed like a super happy guy and had travelled up and down the coast a lot over the years. It sounds like they were from Seattle but head south every fall to get warmer weather. 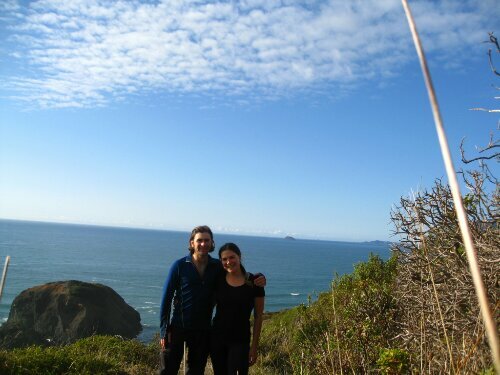 He didn’t know if I’d find anything in Bodega Bay, but encouraged me to go on since I still had some daylight. 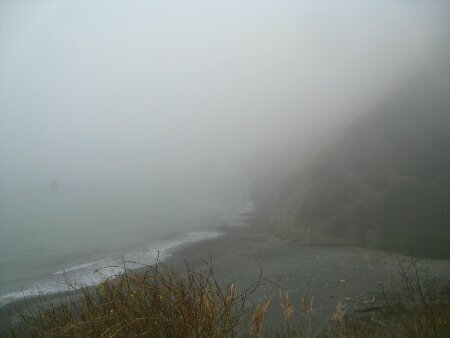 I couldn’t find a place to stay in Bodega Bay and it was super foggy. I had my two rear lights flashing and my two front headlights on, as well as my reflective vest and yellow jacket in order to be seen. I decided to continue on and wasn’t looking forward to sleeping in the cold again. Just a mile or two up the road I came across the Doran Regional Park. The park was apparently closed, but I needed to get off the road. 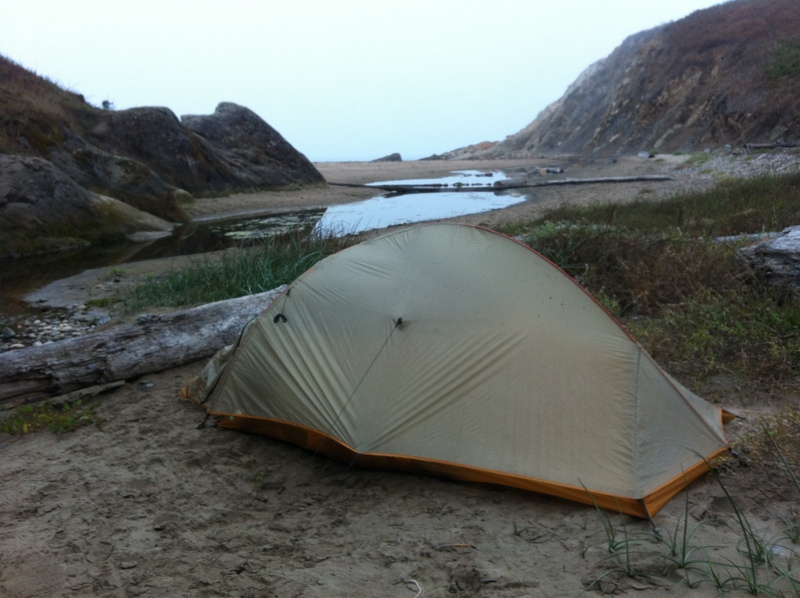 I found a super sweet spot to camp in the sand next to a picnic bench and could even hear sea lions in the distance. It was quiet and warmer than the previous night. I was happy with the spot, and decided to wake up early just to avoid any confrontation that may occur with workers or security or people. I wasn’t sure why the park was closed, but I wasn’t bothered by anybody and it made for a serene night of sleep. 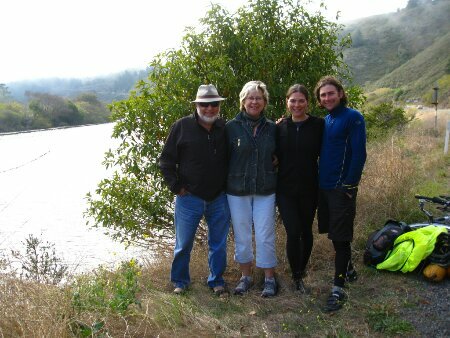 Sarah and family dropped me off at the Navarro River Junction, where highway 1 meets 128. 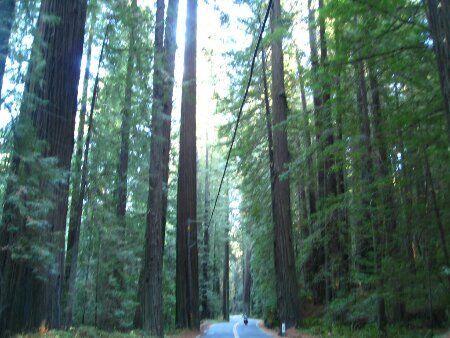 They were all heading inland to drive through wine country and some redwoods, and I was continuing on down the Pacific Coast Highway to San Francisco by bike on my own. Lucky for me I was able to leave some weight with Sarah which minimized my load to just some essentials on my rear rack. My bike was still not light, but it would definitely make the 180+/- trek to SF a lot easier, especially with all the coastal climbs and descents. So, with that said, what better way to start the ride with an ascent! I tried not to stop too much, and was feeling so free with how light my bike was. I was a little worried about feeling unstable since I had all the weight moved to the back and nothing up front, but I got used to the new balance quickly and was moving pretty fast. I think I was averaging about 15mph instead of the usual 10-12mph. On the steep hills I was used to going about 4mph, but now was easily maintaining about 6-7mph. The big difference was that I was able to keep a higher cadence. With how my bike is geared (not having a lower gear on a third chainring), the hills would quickly kill my cadence which kills momentum and is less efficient overall. With my drop of weigh I was able to keep my cadence closer to what is most efficient. I also noticed that I was building up speed quicker on the flat sections, and able to keep it up near 20mph without the effort I was putting in before. All this made for a very pleasant ride to Manchester, and I passed the KOA a little after 5:30. Having still another hour of daylight I continued on and figured I’d find something in the next town up, Point Arena. 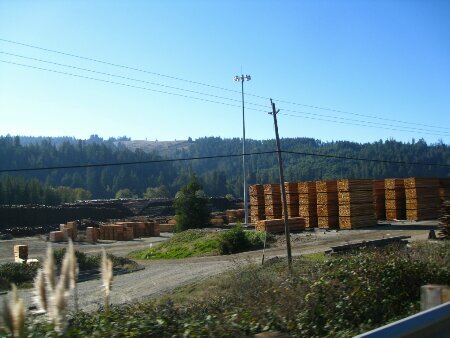 I arrived in Point Arena around 6:30pm and stopped at the natural foods co-op market. They were closing at 7pm, so I didn’t have much time. My phone was dead and I was hungry so my plan was to just get a snack and some tea and charge my phone so I could hopefully find a place to stay. As I searched google for hotels and campgrounds, I was sad to see that nothing was close. I decided to charge my phone until they closed and then I took my hot tea to go and headed across the street to a restaurant/bar to get a proper meal. I ate at a place called the Pacific Plate. It was tasty but a little pricey. The black bean soup and salad with homemade pesto ranch hit the spot. 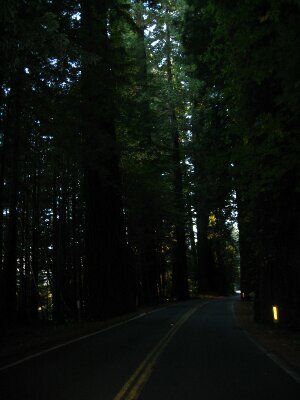 It was about 8pm when I hit the road again and it was dark and starting to fog up. I found a place just outside of town on my phone that looked like it would be a good spot. 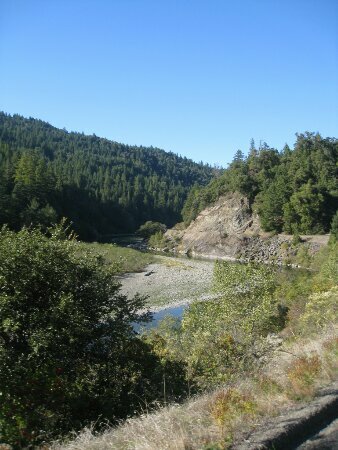 As I turned off onto the dirt road I started having second thoughts, and eventually when I made it 1/2 a mile up the road to a private residence, I knew it was a bad decision. 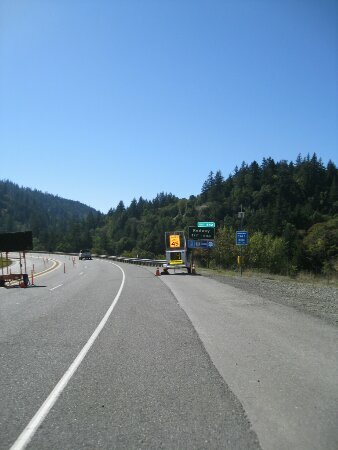 I turned around, made it back on highway 1 and continued south. 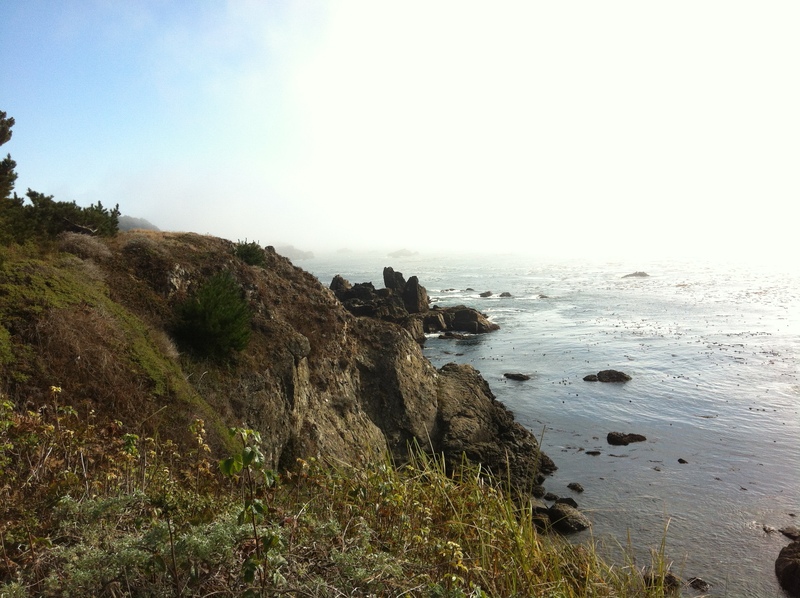 I eventually crossed a gulch and saw a beach down below. I pulled off the road to take a closer look and was greeted by another cyclist. His name was Eli and he had been camping down on the beach for the past few nights. He assured me it was the best place around and told me how to get down to the beach. I had to backtrack to the other side of the gulch again and headed to find a place to set up. 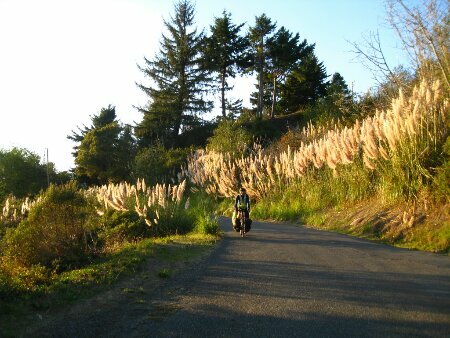 I dismounted my bike to walk it down the trail to the beach since it was so dark. I’m glad I did too because I saw something moving up ahead. At first I thought it was just the shadows from my light bouncing down the path, but then I saw it…a big bushy tailed skunk heading up the trail right toward me. I stopped in my tracks and made some noise. The last thing I wanted was to be sprayed by a skunk. The little guy looked up at me and then took his time getting off the trail and into the bushes. Skunks always seem to have a swagger to them, and I haven’t ever seen them move too fast. It’s like they know that you’ll wait for them because if you don’t they have not fear in spraying you. When I got to the beach I found the perfect spot tucked away behind some driftwood. It was cold and misty but I was so happy to find a good spot. I set up camp and put on my long wool clothing to try and stay warm. Dallas and I found that we had made a wise decision to stop where we did the night before. We packed up and were out of the campground before the sun came up, and started climbing a mountain just as the sun was rising. This climb was not as treacherous as I had feared – the guy we talked to yesterday said it took an hour and a half to ascend – but it was still grueling. 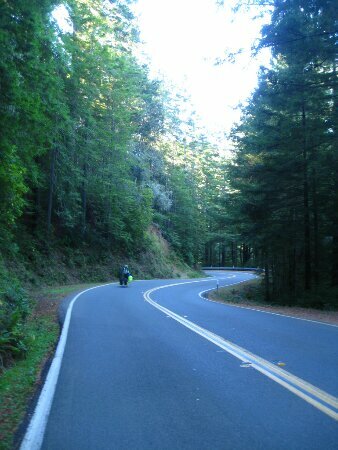 We rode for maybe 4 miles up a steep, narrow, and winding road before we had any break at all. There would have been no place to camp again for the next 27 miles, and it would have taken us forever to get there yesterday evening. The worst part about climbing is temperature control. 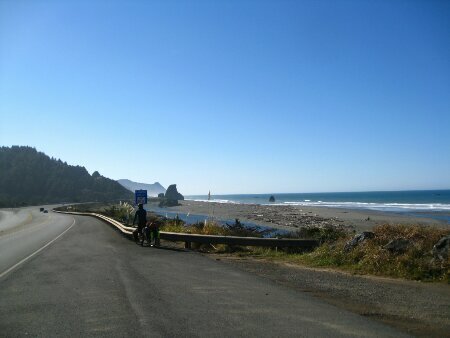 Since the sun hadn’t warmed up the road yet, it started off pretty cold, and I kept having to stop to peel off layers as I worked up a pretty good sweat. The road had warm and cold patches depending on which side of the mountain we were on, but it really felt cold as we started to coast down. With no need to pedal and our clothes drenched in sweat, the apparent wind created by our downhill speed chilled us to the bone. I put my gloves back on midway through the descent, but they were sweaty and useless. 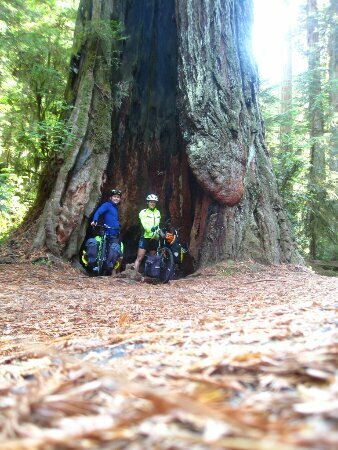 By the time we had to pedal again, my hands and feet were numb. 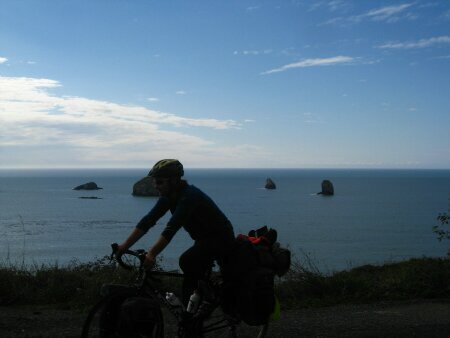 We had another great climb closer to the coast, about 10 miles before we hit Westport. 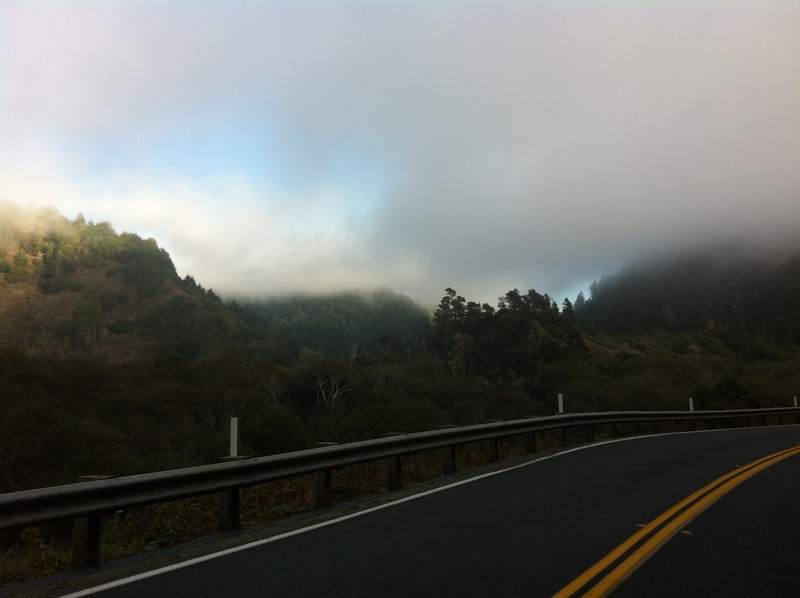 When we finally reached the coast, it was foggy and much cooler than it had been on the other side of the mountains. We pulled into the general store in Westport around 11, having gone just under 30 miles – and it was earlier than we can usually wake up for the day! 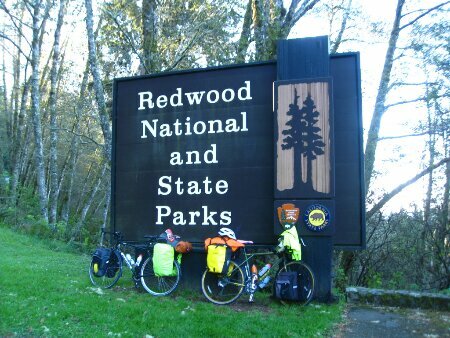 This is where we met Adam, a bicycle tourist from Nashville who had also started his tour in Portland. We talked for a few minutes before Adam continued south and we bought coffee and shared some snacks. I was anxious to get moving and be in Fort Bragg by noon to meet my dad and step-mom, Paulette, who were visiting from Rhode Island. We still had 16 miles to go, and it was after 11:30 when we left the store, so it wasn’t going to happen. 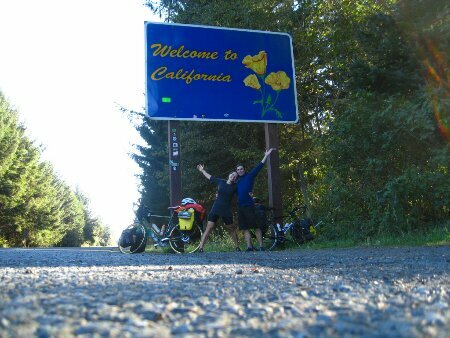 To slow things down a bit more, Dallas and I switched bikes for a few miles. This confirmed our suspicions that my bike is much easier to pedal up hills, with its touring chain rings. I am impressed with Dallas’s strength and ability to grind up hills in ill-suited gears. We did make it about halfway to Fort Bragg from Westport before we saw my dad and Paulette drive by in their rental car. 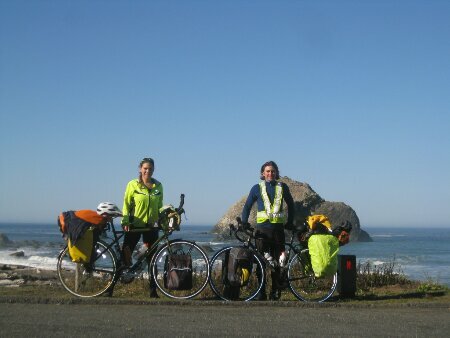 This is where I ended my day of riding to spend the next few days sightseeing San Francisco with them. Dallas and I loaded our belongings and ourselves into the minivan and enjoyed the ride to Fort Bragg, where we ate lunch. 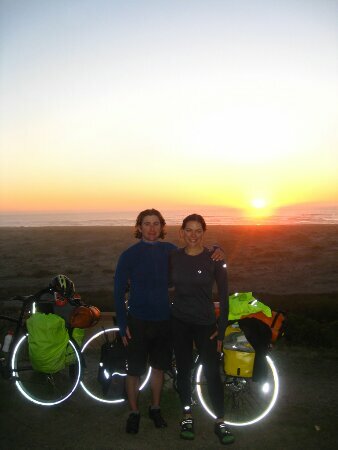 We stopped in Mendecino for ice-cream and drove a few more miles down the coast before letting Dallas out to ride the rest of the way to San Francisco on his own. Dallas will hopefully update all of us on his solo journey from here. I certainly look forward to seeing him when he arrives in the city! It was too cold to sit and eat breakfast in the forest, so after breaking down our tent, Dallas and I rode about 3.5 miles before we found a space where the sun penetrated through the trees. We sat in the warm sun and shared an apple, banana, pear, and an energy bar. 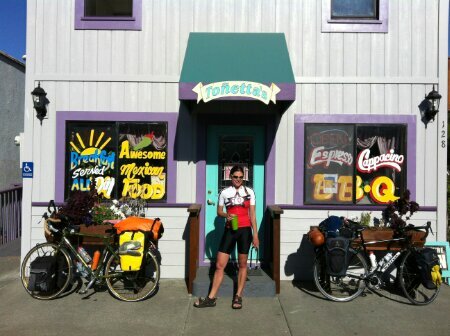 We only had to ride another mile before coming to a coffee shop in the town of Myers Flat. Three shots of espresso and two cookies later, we were back on the road. This was one of those rare days where I was ahead of Dallas for most of the day. I was able to keep a fairly good pace once I got going, but would stop and wait for Dallas every few miles. The stopping and going was draining though, and overall we progressed at a slow pace. We stopped again outside of Garberville to eat our tuna and crackers with some pistachios, a grapefruit and dark chocolate. Even though we were on the road before 10am, we had only gone just over 20 miles by 2pm. As the day went on, the terrain grew hillier, and the second half of our ride involved a LOT of climbing. Dallas was feeling undernourished and sluggish, and I was feeling frustrated for having to stop and wait. As we crested a hill just a mile or two before Leggett, I saw signs for food across the street. I suggested we fuel up over there (The Peg Room) while deciding our next move. The burgers we ordered there were incredible, and they had outdoor picnic tables where we could sit with our bikes. It was starting to get dark, and we had completed just under 50 miles since morning. A couple that showed up while we were eating told us they had biked the coast two years ago and that there is a pretty tough hill coming up to Leggett. It didn’t look like there were any other campground options for another 27 miles, so we ultimately ended up camping across the street from the Peg Room. Maybe we can get breakfast there too!